How awesome. Every year I say I’m going to plan a fall garden, but I don’t. I don’t know what we’d do without a local farmer’s market. Thanks for the tips, I’ll keep them in mind for next year! Thanks for the garden hose clip tip. 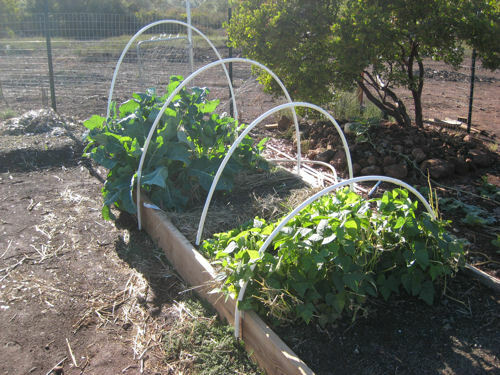 What a great idea and I always have plenty of hose that splits over the winter. Great post! Love the hose tip! Great tips on frost management, I like the idea of mulching but I sometimes think I won’t be able to find the slugs in amongst it. I like your idea of recycling the old hosepipe for clips. I’ve always used the metal pegs in the past to keep the fleece secure in the soil but they leave large holes if you need to move their position which allows the pests to get through, the hosepipe clips look much better. Great post and pics! I’m wondering, though, how warm is so warm that the frost blanket should be removed? Depending on what type of ‘heat’ you get and how much your plants need/want to be warmed. Example: If it is warm and no wind, then it can get toasty under the frost blanket. The frost blanket can raise the temp under it 5-15 degrees (again depending on sun and wind). So if it is getting into the mid 70s, you may want to move the clips up to let a breeze blow through the tunnel. I use iron phosphate for slugs. Sluggo is a brand of slug killer that uses that. Iron phosphate is deadly to slugs, but breaks down into organic fertilizer. But you are right that slugs may hang out in damp hay. you should check out some of Eliot Coleman’s stuff. He is an expert when it comes to growing stuff in the cold. Don’t water when you expect a hard freeze. the extra moisture will cause the plant cells to burst. use more pvc pipe to make clips. 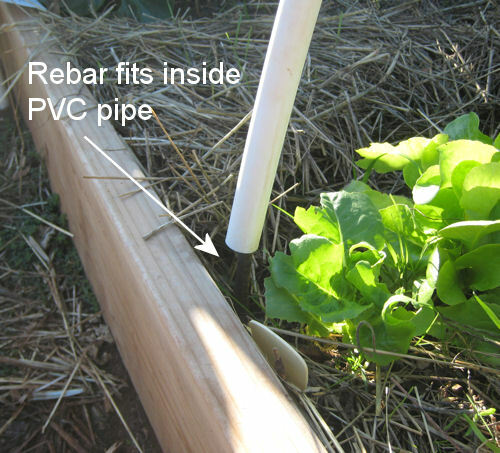 If you use 1/2 pvc use 3/4 to make clips. cut the 3/4 into 1 inch sections and then cut it almost in half. this will make a nice tight fitting clip. Don’t forget to file the sharp edges down though. check out my video for a quick visual. I was stubborn last year and kept plants going to Thanksgiving, in spite of temps in the mid 20s at night. 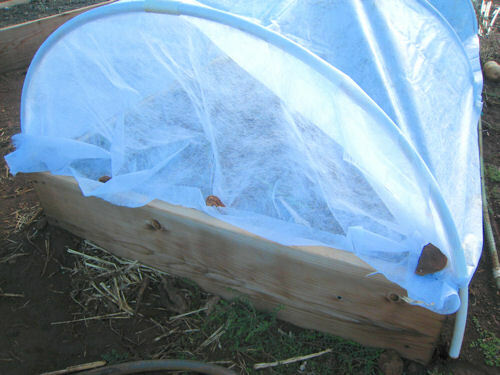 I didn’t have much of a set-up, just a heavy duty frost blanket and I just threw it over the plants and used earth staples to keep it from blowing away. On the coldest nights, I tented some cardboard boxes over some plants. But we already had our first hard freeze two weeks ago. This year, I just didn’t get around to getting any plants in in time for them to get going. So it’s indoor gardening for me this winter. 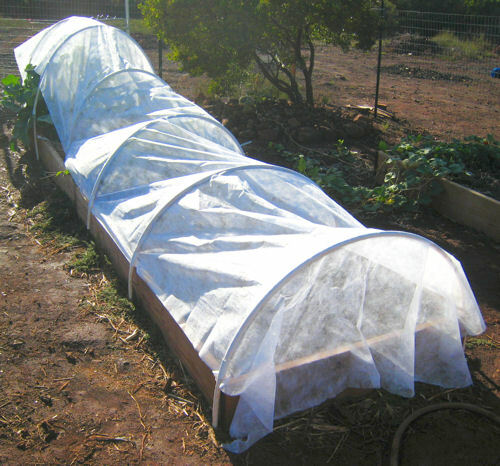 I’ve used a tunnel row cover made of a double layer of clear poly for many years to successfully grow spinach, lettuce, and onions through winter here in the midwest, with temps well below freezing. Wire hoops are integrated into the poly every two feet, with about 6-8 inches of wire to stick into the soil on either side. The 16 ft. long tunnel was less than $20 on sale. 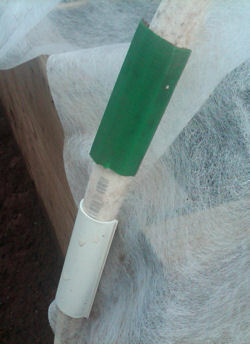 Love your coldframe and I agree that your PVC clips hold tighter than hose. 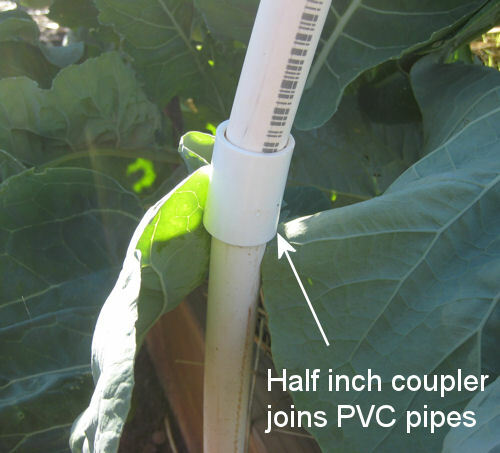 The PVC is a good idea if you can or don’t mind buying the extra pipe and the extra work. You will get better holding power. In my case I had an old hose and don’t mind the fact they aren’t as solid fitting. I am using them in the center poles now and the expensive clips on the ends. As for not watering during a hard freeze, I think I disagree with Eliot on this point. His argument is bases on the fact that the part of the plant that is not water (80-95% of the plant is water) has a lower freeze temp than water. But the water is there to keep the soil warm (warmer than freezing) The combination of water in the ground and cover over top is what protects you from freezing. I watched one of Eliot’s teaser videos on YouTube. In the video he mentions how the water condensing on the top of the greenhouse cover creates a prism effect to help warm the greenhouse during the day. It takes a bit of water to do this, so I think he is keeping his ground saturated too. Water will do more good than harm. I think it is dangerous to find a watering level that warms the ground and allows condensation on the top of green house, yet keep the water in the plant at a lower concentration. 9 times out of ten you will do better watering. If you want an extra bonus for a hard freeze, I would let a hose sit with water inside during the day and absorb solar energy (what it can) and water in the mid to late afternoon. Every extra calorie of energy that you can try to store in the ground will help. And with a really hard freeze, there is not much that can save your veggies.